Dallas Fair Park 11 - Automobile Building. Although similar in nature to the Centennial Building with its exterior and 650-foot length, the Automobile has a very different past. It stands on the ground previously occupied by a wooden building. Built in 1913, the facility was used for displaying cars. The Automobile and Manufacturers Building took its place in 1922 as a larger and more sturdy place for the shows. George Dahl remodeled it for the exposition, then placed two buildings on each side. Forming one structure, the Pavilion of Electricity, Communication, and Industry had three statues and six murals just like its partner across the pool. However, the artwork was designed by different people. 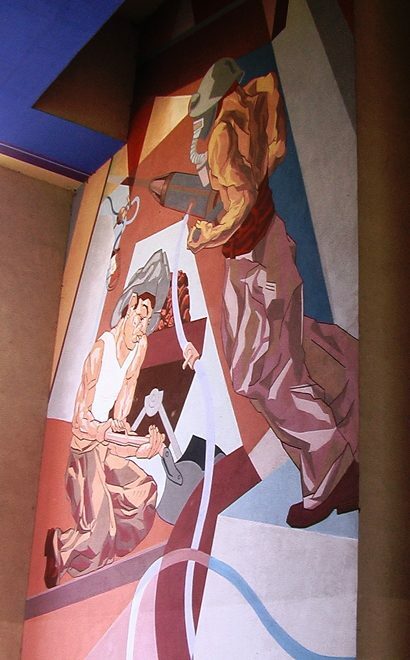 Raoul Josset and Jos� Martin worked on the statues while Pierre Bourdelle focused on the murals. The concrete structures represented the nations of Mexico, France, and the United States. 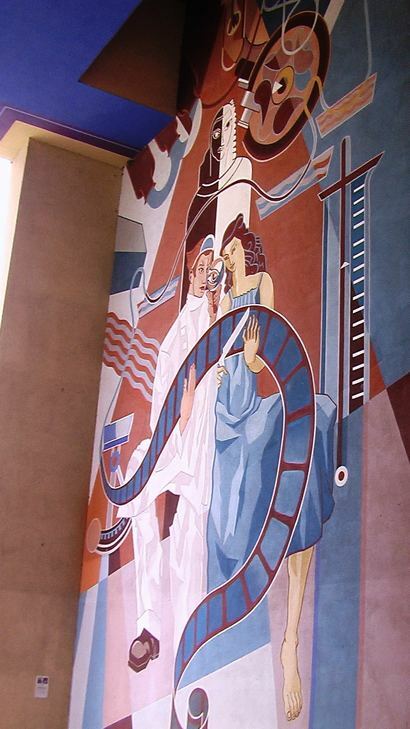 Instead of reflecting the different modes of transportation, the murals depicted the different types of professions being representing inside the pavilion. 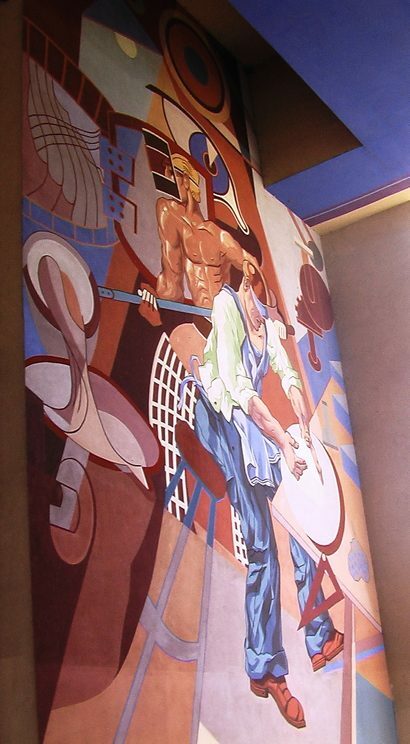 Five years after the Pan American Expo, which took place in 1937, a fire completely destroyed the building and all its murals. The statues still remained, but they stood alone until 1948. The Automobile Building, originally called the Pavilion of the Automobile, was constructed at the cost of 800,000 dollars that year. Designed by Walter Ahlschlager, it had no murals or porticoes. 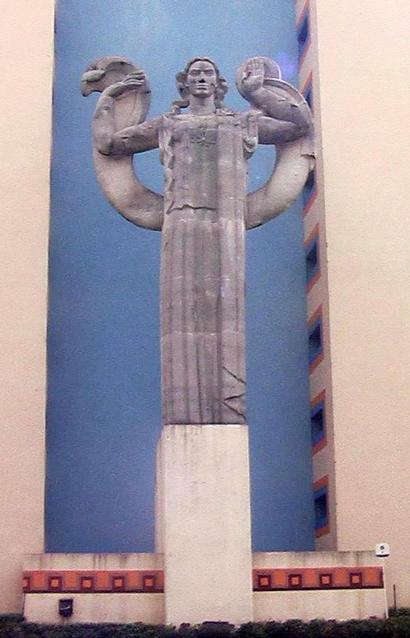 The new structuring meant that the statue would stay separated from the main facility. This separation ended in 1985 when porticoes were added in preparation for the Texas Sesquicentennial. 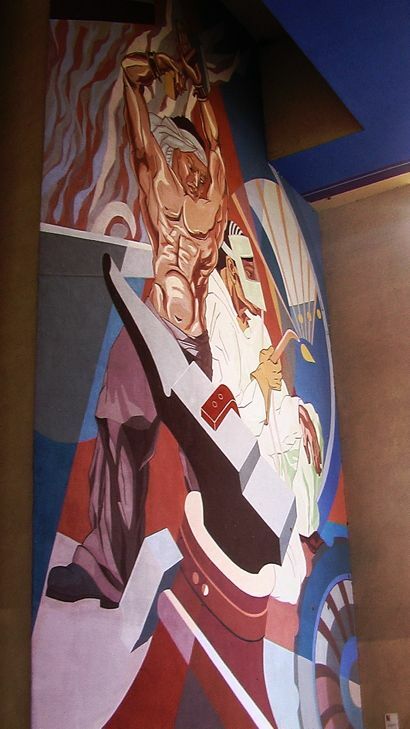 In 1999, the State Fair Association provided funds for the Friends of Fair Park, a non-profit citizens' group, to reconstruct the decimated murals. EverGreene Painting Studios from New York City performed the task and completed it the same year. Using Bourdelle's original glass slides, workers projected the artist's drawings onto the paper covering the wall. They then punched holes with a brass wheel over the design. The artists took pounce powder and applied it to add lines to the wall. 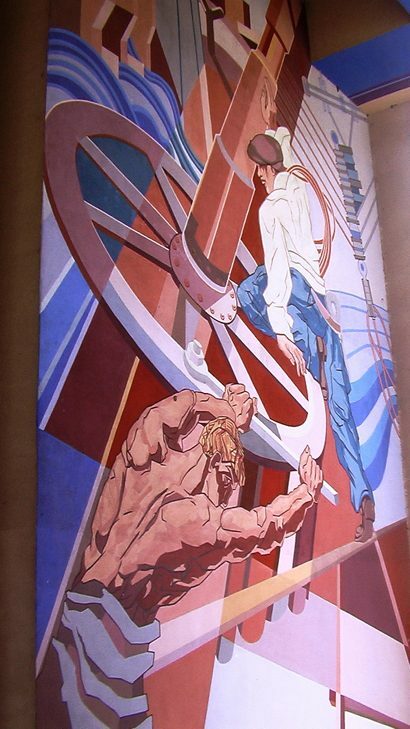 Once this was accomplished, they painted the new murals using drawings and photographs as references. 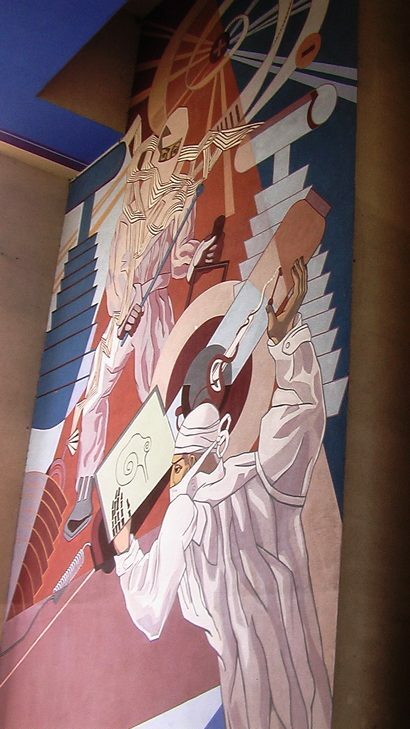 For the final step, the murals received a mineral-based coating to protect them from fading. 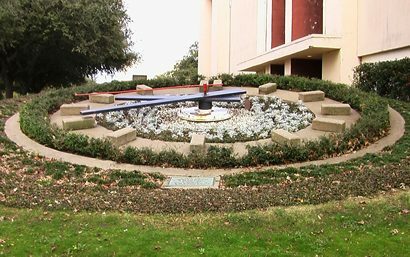 On the southern side near the front of the esplanade pool, a flower clock pays tribute to former mayor Austin Starke Taylor, Jr. as a symbol of friendship with the city. Received in 1986 by Steven M. Park, the project design manager of the Dallas Park and Recreation Department, the clock was a gift from Mr. Cho, the president of a Japanese company named Samhwa. The president insisted, however, that his grandson Tatuya Hakata should be the one credited for sending the donation. The final cost of installing the gift reached 12,952 dollars. The dedication of the flower clock took place in June 1987. The statue of the first portico that visitors encounter represents the nation of France. Its flag flew over Texas from 1685 to 1690. The period began with the establishment of a colony by Ren�-Robert Cavelier, Sieur de La Salle. The French explorer began his working career as a wealthy merchant. After a brief tenure training to be a priest, La Salle gave up the profession and moved to Canada in 1666. He settled in an area near Montreal then started getting involved with the fur trade. Tales about a large river that intersected with the Mississippi River and reached the Gulf of California soon entered La Salle's ears. If true, it would mean a better route to China. La Salle decided to take a chance, selling his fortune to finance the trip. He made it all the way to the Ohio River, but crew desertions forced him to turn back. He then went on a series of expeditions that resulted in the establishment of forts and outposts in the Great Lakes region and along the Ohio, Illinois, and Mississippi rivers. After naming the land serviced by the Mississippi, La Louisiane in honor of King Louis XIV, La Salle returned to his original homeland in 1683. La Salle managed to obtain royal support for a voyage to the Mississippi River, using a water route instead of a land-based one. He hoped to travel along the Gulf of Mexico and establish a settlement and fort near the Great River. The journey started in 1684. After a series of misfortunes, La Salle's crew became lost and mistook the Matagorda Bay inlets for the opening to one the Mississippi's many arms. When it became apparent that he was wrong about the location, La Salle, his army, and 180 people set up a colony and built Fort St. Louis near the Lavaca River in present-day Victoria County. Within a period of six months, more than fifty percent of population died from a combination of disease, sickness, malnutrition, exposure, exposure, and hard labor. La Salle made two trips to get his bearings and find the Mississippi River. During a trip to the Illinois River in hope of finding help at one of the trading posts, Pierre Duhaut murdered the explorer. The crew never reached its destination and the situation at Fort St. Louis worsened. There were only twenty-five settlers left in 1689. That fateful year brought the arrival of a band of Karankawas. Pretending to be friendly, the Indians entered the small village and massacred everyone except the five remaining children. All the kids spent their time living among the Karankawas until the Alonso De Le�n and Domingo Ter�n de los R�os expeditions freed them from their captivity. When news of the massacre spread the following year, France showed no more interest and Spain displayed plenty. 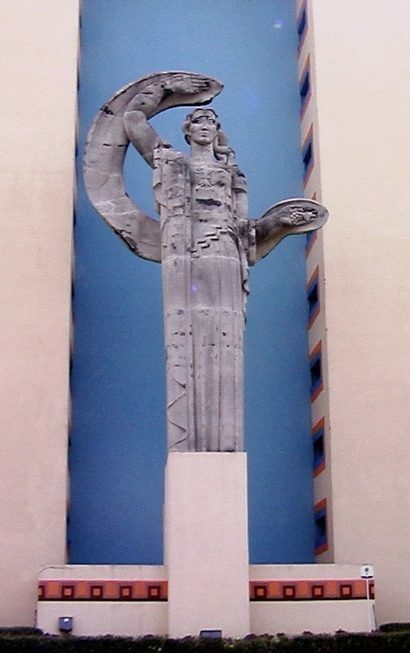 The second portico's statue represents the nation of Mexico. Its flag flew over Texas from 1821 to 1836. Like Spain, the Mexican government wanted to populate the Texas region but didn't have the resources to do so. Furthermore, most people were too poor to migrate. This meant that officials would have to rely on foreigners to move into the area. Officials decided to use an impresario system to colonize Texas. An impresario, a land contractor or agent, would obtain a contract with the government and offer the land to families or individuals. After buying the land, purchased by the acre, the prospective settlers would have to swear an oath of loyalty. The first impresario to arrive on the scene was Moses Austin, who managed to secure a contract for three hundred families in 1821. When he died that same year, his son Stephen F. Austin took over and settled the people along the Brazos and Colorado River. This was followed by the immigration of at least 2,000 families under the guidance of impresarios Haden Edwards, Robert Leftwich, Green DeWitt, and Frost Thorn. Others soon followed as the regulations became more relaxed. This led to various degrees of corruption and violence. As time passed, the Mexican government started to become paranoid toward the United States, fearing that the nation was making plans to steal Texas. This resulted in the passage of the Law of April 6, 1830. The legislation made it illegal for any Americans to enter Texas unless they had a passport. It also forbade the importation of slaves. The efforts to enforce the new law eventually led to the Anahuac Disturbances of 1832 and the Battle of Velasco. From there, the friction between the Mexican government under Santa Anna and the colonists of Texas escalated into a full-scale revolution. The Texans won with the victory at San Jacinto on April 21, 1836. 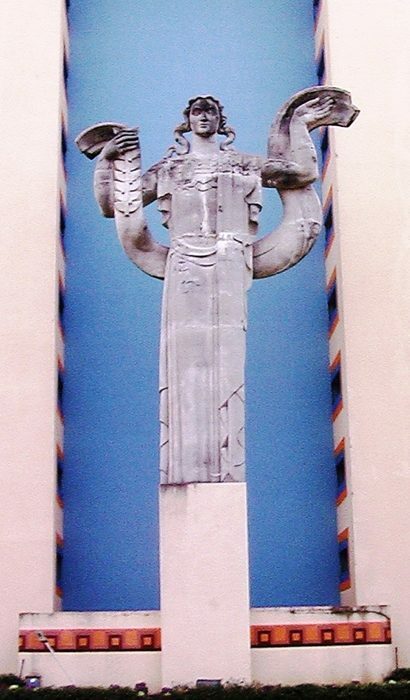 The third and final portico has a statue representing the United States of America. Its flag flew over Texas from 1845 to 1861 and 1865 to the present day. It all started with the nation's annexation, an issue filled with controversy. With American politics in great turmoil over slavery and its abolition, many people felt that the introduction of another slave-holding state would make the situation worse. They also didn't want to start a war over a territory which Mexico refused to recognize as an independent nation. Sam Houston wanted this recognition and managed to get Britain to mediate a future meeting. In an effort to get the needed support for re-election, President John Tyler met with Houston secretly and worked out an annexation deal. His efforts, however, did not lead to his renomination. Whig candidate James K. Polk, a man who favored annexation, won at the convention and defeated Democratic candidate Henry Clay. Tyler then decided to use the election as a mandate for the passage of the treaty he had made with Houston. Congress approved it with a simple majority in December 1844. The following year, the new president signed the annexation agreement after it had been ratified by the Texas government. Texas left the Union in 1861 to join the Confederacy. After the Civil War, the state had to comply with a plan of reconstruction in order to officially enter the Union again. The whole process came to an end in 1870. Since then, Texas has remained a part of the United States. 5.Slate, John H. Historic Dallas Parks. Arcadia Publishing, 2010. 8.Winters, Willis Cecil. Fair Park. Arcadia Publishing, 2010.